Sweeping autumn leaves this afternoon it suddenly seemed to me that each leaf had a story to tell. The memory of my first contact with Vicky Wall came to mind. It was a phone call. I was young, 23, just out of university. 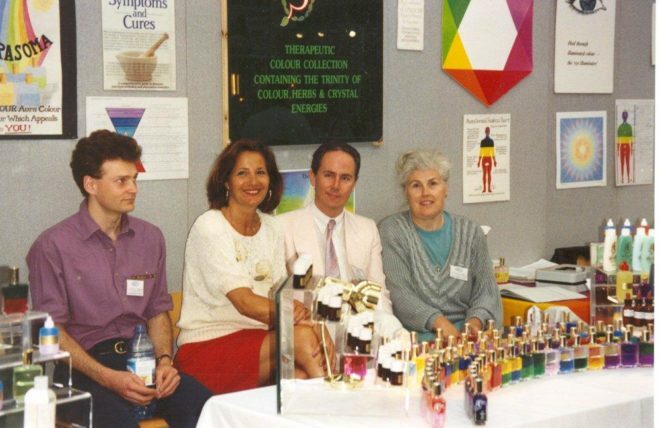 I had seen the Aura-Soma stand at an exhibition but being shy in those days i only looked and took some leaflets. Now, at home, a few days later, I took my courage and rang the phone number at the bottom of the leaflet. “Hello” came the voice. I did not know it then but it was Vicky Wall. “Why have you rung?” the voice asked. I didn’t know it then but i came to realise later that she said this to almost everyone she met. When i discovered this i struggled with it for a while, how can she say this to everyone? However, now, years later, I can say I have come to understand how she could say this and mean it. The way i came to understand it was through wondering about another question of Vicky's life. Why did Vicky always wear white? It is a significant question since wearing white has been the guideline for all Aura-Somam teachers and Practitioners for many years. One day i had my answer. For Vicky wearing white aas an expression that she was on duty: serving spirit. In Vicky's world this was pretty much every hour of the day. It was certainly the case whenever she was representing Aura-Soma. As far as Vicky was concerned Aura -Soma was the only reason she was still on the earth. “I am living on borrowed time” she often said. Aura-Soma was the gift form spirit, her mission in this lifetime, and as long as she had the strength to do so she would be serving that mission. Aura-Soma had given Vicky Wall's life a sense of real purpose. A gift from Spirit that she had to birth and raise, like a child, in the world. She was so committed to the mission that it coloured the way she looked at the world. Everything and everyone she met along the way now became imbued with potential meaning too. Thus she could say sincerely to each new contact she made, "This meeting is meaningful." It was Vicky’s depth of commitment to Spirit that made it so. 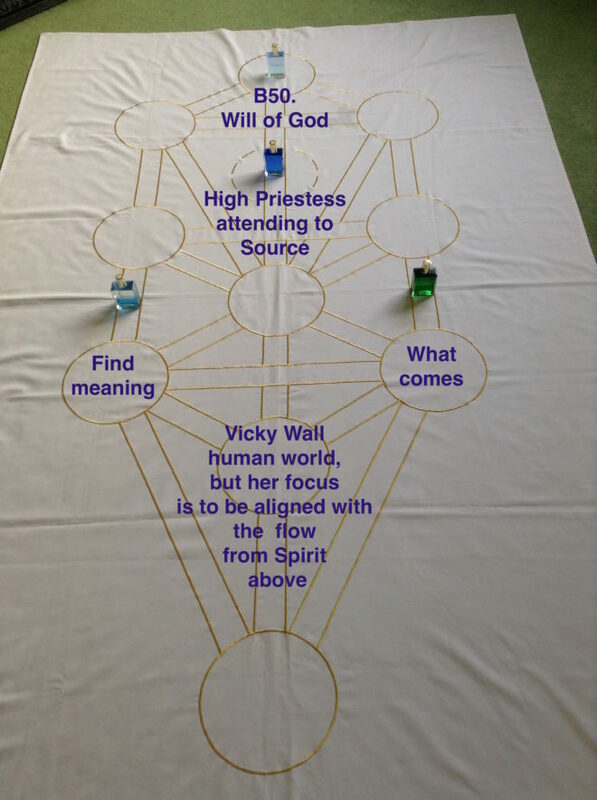 I was happy this memory came to my mind because its theme - finding or giving meaning to what appears in the flow of our life - is a theme about which i recently had a Tree of Life insight. The Tree of Life can be divided into two halves; the upper half and the lower half. The upper half is the World of Spirit, the lower half is the World of Human Experience. These two worlds are connected through the centre by Tipahereth - our soul self, which has a presence in both worlds. There are two further connections though between these two worlds. These are the paths that run either side of the centre: The Wheel of Fortune (B10. Green / Green) down the right and The Hanged Man (Clear / Blue) down the left. It is these two paths working together that results in the recognising of meaningful synchronicities. The Wheel of Fortune brings the new into our life, while the thinking mind, located at the foot of the Hanged Man looks for purpose or meaning in that which has newly appeared. This can perhaps be more easily understood in reverse. When something important but unwelcome has appeared in our life and turned our world upside down, we may struggle to say accept it. The clear (suffering) over the blue (theme of acceptance) which is active in the deeper mind. If we can find a reason to explain the presence of this thing it will be much easier for the thinking mind to say accept what's happened. A recent example that comes to mind is the October mass shooting in Las Vegas. The news stories were full of "Why?" "What was the motive?" On the rational side of the Tree exists the need to find meaning. On the irrational side, things just happen, the Wheel of Fortune. The irrational side is created with stepping out of The Fool from the Source. The Fool who has no idea, who acts without reason. The thinking mind struggles to accept this, there must be a reason. The mind's job is to create order, and order requires reasons. This world is not by chance, it was willed into being by a Creator, The Magician, the one who must have had an intention, a blueprint, a purpose in mind. In Vicky's understanding nothing happened by chance. All was given by Spirit. From this perspective it was natural that she considered every meeting meaningful, an opportunity for purpose. People who are spiritually oriented will tend to look for meaning in the circumstances that life brings. Why is life bringing me this? What is the opportunity here? I will leave you with the earliest picture i have of me with Aura-Soma. I am at another exhibition and by now part of the team behind the counter. Next to me are Ingrid Khalif, Mike Booth and Sheila Bearne de Martin - the long time Spanish distributor. 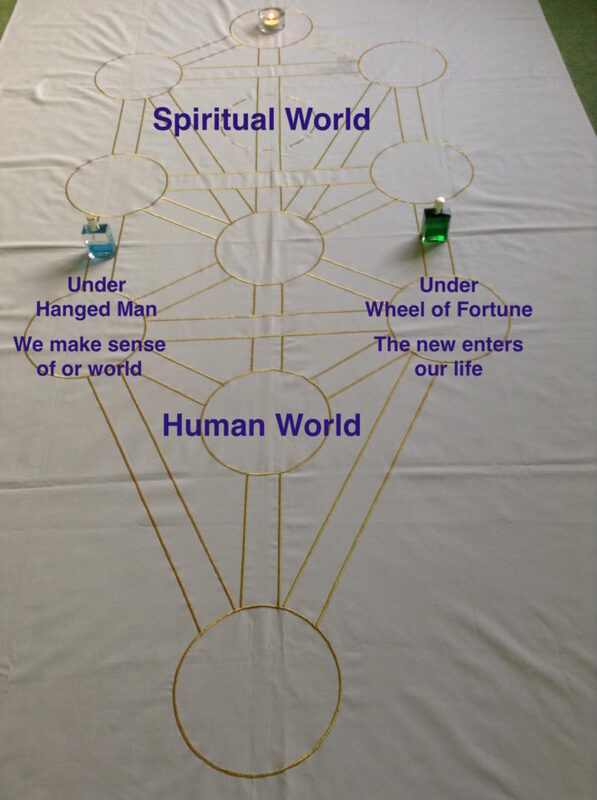 Fabulous article and love that why of looking at the tree of life. Thank you Dominic. Very wise words. I am sure Vicky is looking down on you and blessing you as, for me, you embody the true spirit of Aura-Soma.